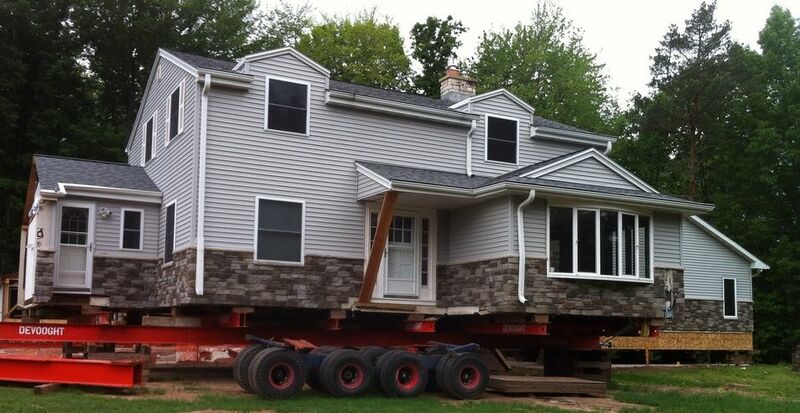 It costs $75,000 to move our house. Should we do it to split the lot? The initial reaction is that it is not a good idea. However, there may be local knowledge driving the consideration for this project that cannot be assimilated from a distance. Here are some questions to research that can help determine if it makes sense. Reader Question: We own a one-acre lot on a street with mostly half-acre lots. We are considering splitting the lot into two half-acre lots. The only problem is the house is in the middle. It would cost about 75k to move the house to one side. Would it make sense to divide the lot? Elizabeth P.
Monty’s Answer: Hello Elizabeth, and thanks for your question. The initial reaction is that it is not a good idea. However, there may be local knowledge driving the consideration for this project that cannot be assimilated from a distance. Here are some questions to research that can help determine if it makes sense. Why was the subdivision platted in the current fashion? What percentage of the lots are one acre? Most often in subdivisions the lots are a similar size, so by discovering why it platted in this fashion originally, you may come to the same conclusion as the original developer. As an example, if the originally plat was to avoid some natural barrier such as near-surface bedrock or an underground slew, it may be a reason to abandon the idea. A quick title search for deed restrictions or covenants may reveal restrictions included to prevent such a change. While the belief is it will cost $75,000 to move the house a very short distance, how do you know? While it is an indicator, one estimate from a local house mover does not mean it will cost $75,000. With an expense of this magnitude for a fairly uncommon occurrence, it pays to seek estimates from other house moving companies. Different companies may have different methods and tactics for a job such as this, and the cost gap between bidders could be significant. What does the $75,000 include? · survey the lot and gain the approval of the municipality. · house your family during the physical move. · store and then move your furniture next door (house movers will not move a house with belongs inside). · install sewer, water and utilities next door. · disconnect the old utilities to meet code. · demolition and removal of the old foundation. · build the new foundation. · secure temporary housing while moving your home. Most importantly, know what the new vacant lot will be worth on the market, and what it will cost to sell. Larger cities with highly valued infill lots and many conveniences can be a competing choice over outlying communities with long drive times and fewer services. A local real estate agent with experience in new construction could be an excellent resource for market information and experience. This is a situation where multiple opinions will be fruitful. What if it costs $50,000 to move the house next door and $25,000 for all the items listed above. If the move creates a lot worth $150,000, will it be enough money gained for the time and inconvenience invested? If $75,000 is the true cost to move the home and the newly created lot is worth $50,000, it will be a costly decision. Some homebuyers will shy away from an infill lot because the competing new subdivisions have every family in the neighborhood looking for new friends. They may believe it is easier to make new friends in a new subdivision than an established neighborhood. An item that may influence thinking about the project is if renovation work is being considered. For example, if a new kitchen or adding a lower level living space is the thought that sparked the idea, this may be a good time to coordinate the efforts. Exterior siding or new windows are other examples of a significant re-model. One last caveat is the makeup of the neighborhood. Will a brand-new home fit in with the neighborhood on the newly created lot? If the homes on the block are turn-of-the-century behemoths, the new structure may not fit well. Architectural design and construction methods (and materials) have changed in the past 100 years. It is possible to reduce the market appeal of a home if it is inconsistent with the supporting cast, and in some instances, upset the neighbors.